Colour grading tends to specifically refer to the colouring of video and in photography we often refer to this as colour toning, but whatever you're happier calling it, this process of making a conscious decision to apply a specific colour-look to an image in post production is an incredibly powerful tool. Before we begin, just let me clarify what qualifies as colour correction and colour grading. Colour correction as a rule tends to be more objective in that its goal is to make a scene look as 'accurate' to reality as possible. 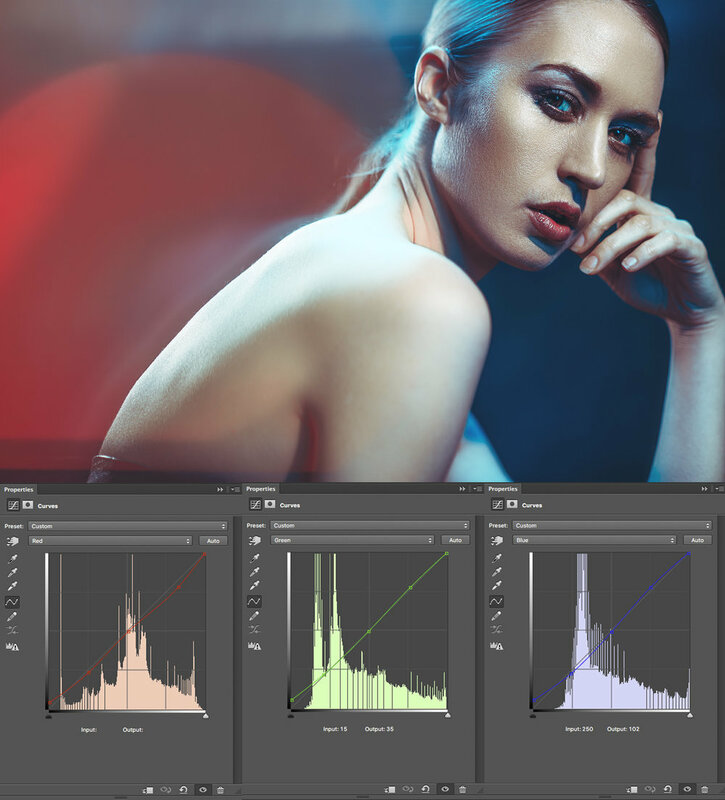 For example, if you take a shot and your white balance is incorrect resulting in the subject looking a little yellow, you would colour correct this by adding blue thereby cooling down the image and correcting the skin tone to a more natural and realistic colour. Colour grading and toning will usually build on top of a colour corrected image to change the colour of a scene to denote a certain look and feeling. This is a far more subjective process and not necessarily right or wrong. For example, if your shot was a beach scene, you might add a little orange and yellow to the shot via a colour grade to give the image a warmer feeling. Conversely, a shot of a skier on a mountain might have blues added to the image in post production to give a cooler, crisp impression to the final photo. Colour grading is far less about right or wrong but more about personal artistic intent. Okay so now that we know what colour grading actually is, we can start to look at some processes and examples. You may have noticed that earlier I mentioned 'colour grading will often build upon a colour corrected image'. What I mean by this is that I personally find it a lot easier to colour grade a colour corrected image. There are a couple of reasons for this but most importantly it gives me the option to adjust my colour grade if I change my mind later on. By applying colour grading and colour correction separately I still have my colour corrected base to work on rather from starting from scratch each time. In the image below, I first colour corrected it and then I colour graded it. You may be asking why I had to colour correct it to begin with. Well that's because I purposefully shot this incorrectly coloured with the intention of correcting it later on in post. This slightly odd way of working can provide some very unique looks. This series of images was shot of an actress and model Lucy B and the goal behind them was to create cinematic portraits. In the original setup I was drenching the scene in colour with the intention of colour correcting them afterwards. This might sound strange (and frankly very risky) but if you look again in the shadows, especially around the eyes, you should see that there are subtle colours in the shadows and highlights of the shot that are outside the grasp of the colour grading. It's this subtle yet effective look that I was going for. Just to be clear, colour grading does not always have to have odd and tricky coloured lighting already present in the shot. Any image can be colour graded/toned, it's just that I'm showing you extreme examples of colour correcting and colour grading here to prove just how powerful the technique can be. It's intentional lighting techniques, including purposefully washing a scene in colour like my image here, that can go hand-in-hand with colour grading as a final look rather than simply just an after thought. Cinematographers will often employ this same colour wash technique in-camera along with extreme makeup to make a scene effective. For example, JJ Abrams shot a very cold looking scene in his original Star Trek film. He heavily lit the scene with strong blue light and the actors had features like their lips painted bright magenta so that under strong blue lighting and after some colour grading, their lips looked a somewhat normal colour. This is colour grading with intent and although colour toning and grading can be applied to any image, with a little forethought prior to shooting, you can really make colour grading a very powerful tool indeed. Take a look at the three shots below. The first is the original file, followed by the colour corrected one and then finally with the colour grade added. You should now be able to see the process behind the look and hopefully elements like the subtle coloured shadows and highlights should make more sense. Now let's look at the actual process of applying these colour corrections and colour grades. In the image above, you can see how I have my colour correction curves laid out in my layers stack as well as my colour grading ones too. There are so many different ways to colour tone an image so please do what works for you, but I simply use curves. The reason for this is that curves interact with each other in a more dynamic way compared to other colouring options. For example if I tweak the midtones, it affects both the shadows and highlights slightly as well which gives a far more organic feel to the colouring. Also, curves are incredibly good for being adjusted multiple times after the fact and can also be manipulated very intuitively when looking for a desired effect and colour. In the above shot you see my Photoshop layout where the colour correction curves are split into the three colour channels of Red, Green and Blue. On top of that I then add a complete new set of curves that are my colour grading curves. Again these consist of the individual Red, Green and Blue channels. This is done so that I only ever modify the red curve in the red channel, the green curve in the green channel and so on. This makes it very easy to turn individual colour channels on and off and see what colour is affecting what. For example I might come back and look at this image later on only to feel that it's too red, I can then go in adjust that one channel accordingly, safe in the knowledge that I wont be adding other colour issues in the process. Above we can see the three curves for each of the RGB channel curves. Granted these curves will be different for each shoot but I thought it might provide some further insight into how I arrived at my final colour corrected image. If you're unfamiliar with how curves work then they're broken down like this. The shadow areas can be adjusted by adding and tweaking nodes (those small hollow squares) in the bottom left of the curves window, the midtones can be adjusted in the centre and the highlights can be manipulated in the top right. Adding and moving one node will affect colour and tone across the entire curve unless it is anchored elsewhere. For example here you see the highlight node being lifted but it is also lifting the midtones too. A smooth curve with as few a points as possible will often yield the most natural results. Pro Tip: Don't forget that you can also shift the black and white points. Here we see that I have lifted the very bottom left node up slightly. This will add green to all the pure black areas of the shot. The same could also be done at the other end in the far top right at the white point too. In the above shot we can now see that I have added three additional curves and these will sit on top of the other colour correction curves. I mentioned before that I like to try and keep my curves as smooth and as clean as possible. This means I try and use as few nodes as possible and generally this is kept to one node in the shadows, one in the midtones and one in the highlights. Additionally I will often shift the black and white points too (these are the nodes in the far bottom left corner [see the green curve above] and the top right corner node). By keeping the curves smooth like this you avoid adding extra colour issues by avoiding sharp transitions in tone and colour. In the above shots we can see the process again, firstly with the original shot, then the colour corrected version, and finally the colour graded version. But you may also have noted that there is only a slight difference from colour correction to colour grade. Let's take a closer look at the curves involved. With the colour correction curves in place there isn't anything too surprising at work here but it is worth noting that I've lifted the black point (bottom left node) in all of the colour channels to really get rid of any deep dark black areas. Now let's take a closer look at how I graded this image. In the image above we can see the extent to which I have colour graded the shot after colour correction. In fact there actually was no further 'colouring' that took place in this image. All I have done is to shift the black point up slightly and to bring the white point down slightly. This is a technique often used in colour grading to reduce overall contrast in an attempt to make an image more visually homogeneous or to reduce the visual distractions that very bright highlights and very dark shadows can have. I wanted to share just one more shot and although very similar to the above shots in terms of its final look I think it shows just how incredibly powerful curves can be when it comes to colour correction. If we look at the original shot above, you'd be forgiven for thinking that the image was a 'write-off/re-shoot'. The skin colour looks awful with a heavy cast of blue and magenta all over it, but with a bit of clever tweaking we can bring back a very believable skin tone that still retains some of that cinematic colour in the shadows and highlights. Now that we can see the individual curves, we can break down what was done to achieve the colour correction. We can see that reds were removed from the highlights but added to the shadows, we can also see that very little was done in the green channel but a huge amount of blue was pulled out across the entire image in the blue channel. The resulting shot is colour corrected but still with that coloured cinematic theme being present in the dark shadow areas as well as the highlights. This is a dramatic technique and one that takes a little practice but one that will offer up very unique looking results that rely more on the colour correction than the actual colour grade. Let's look to see what we did for that final step in this image. So the actual colour grade for this shot was simply copied and transferred from the previous image. All you have to do is drag the curve from one document to the other. You don't have to hold shift to make this work but it's a good habit to get into as holding shift ensures that any layer you copy and transfer from one document to another document stays centralised on the page based on the source location. By copying and transferring curves in this way, you ensure a consistency between files in a series of shots and it is far easier than trying to recreate the same curves in every file. I know this has been a long post but I feel there is a lot to cover on this technique and in actuality I've barely scratched the surface. But here's recap of the most salient points I've spoken about so far. Think about the final shot including the post pro stage. Colour grading can be done on any image but do you want to shoot the image with colours to then colour correct them later? What is your final intention? I persoanlly prefer to keep things separated on my file so that I can adjust things later. For example I colour correct first, then I create a whole fresh batch of colour grading curves to apply on top of that. Doing it in this way enables me to turn off the colour grade layer and check the colour correction later. You'll be surprised how useful this can be. I think it makes colouring far easier when you can turn off and on individual colour curves afterwards to see what colour is affecting what. This is only possible by separating your colour curves into Red, Green and Blue. Try to have as few nodes on your curve as possible. Too many nodes will only introduce odd colours that will be hard to deal with. 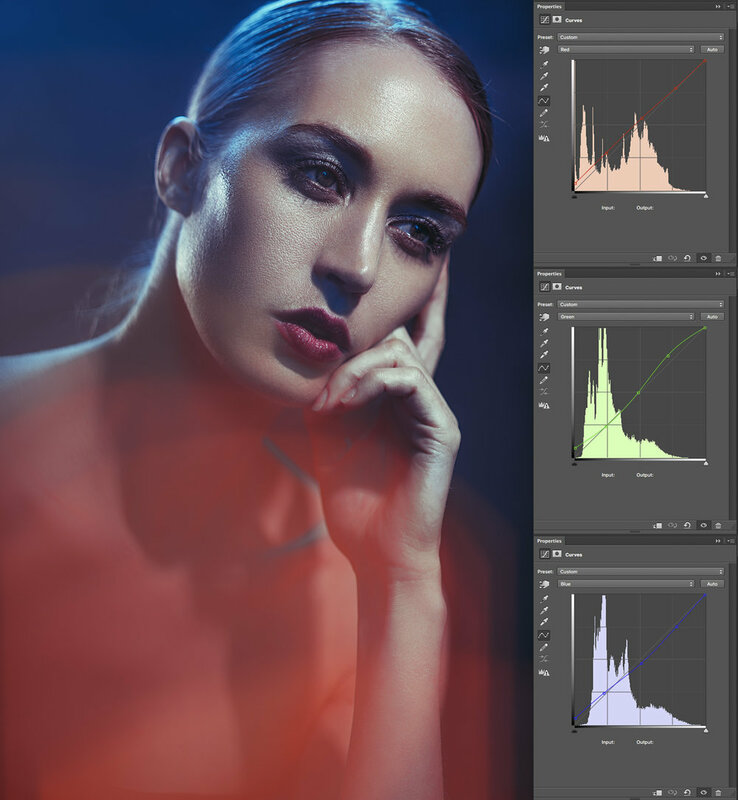 As a guide, try to only have one node in each highlight, midtone and shadow area. Don't forget that you can copy and paste curves among multiple documents. Simply click and drag them from one layer stack to another. The colour grading topics I've discussed here are fairly complex. Not in their execution, as adding a few curves is easy, it's colour grading with intent that will take time to master. Sure, any image can have colour grading applied to it and that is hard enough in its own right but colour correcting heavily coloured imagery first is a little harder to get good at. Drenching your shots in heavy colour with the intention of colour correcting them later is a very tricky process due to how hard colour correcting can be on skin with colour in midtones, highlights and shadows. Stick with it though, as you can produce something very visually unique, and in my mind this is well worth the extra effort. Remember that colour grading is a career in its own right and big film productions will employ colourists for this sole job, it's easy to pick up and play with but incredibly hard to get good at. Think of it like being able to tune a guitar without a tuner. You might know its out of tune but its far harder to get it in tune unless you've trained your ears. The same applies here with colour and you have to train your eyes to see variations in colour until you can correct it accurately and consistently. Don't get put off by this though as the images I colour corrected here in this article are very extreme examples of colour correction. Over time, you will get better at seeing colour so just stick with it and you'll see the improvements. One final point, be sure to never flatten your curves into your document as you'll always want the ability to adjust colours later on. One day you might love the colours you've added but you may come back a day later or even an hour later and hate them. This is perfectly normal so don't get frustrated with it. Keep returning to your file to check and tweak things and as time goes on you'll finally be happy with it. I was a colour printer in darkrooms 20 years ago and I've been colour correcting and colour grading throughout my entire photographic career since then. The images featured in this article still took me two days to colour correct and grade. Colour correction and grading is an art in its own right and getting good at it simply takes time and patience. But unlike other things in life, perseverance with art actually ensures success. Thanks once again for taking the time to read my articles, I certainly appreciate it and feel free to share this with anybody who you think could benefit from it.